There’s nothing like the smell of a barbecue filling the hot summer air and making the taste buds tingle. When you are watching the calories, there’s also nothing like the disappointment of fatty burgers, sausages and kebabs all served with overdressed salads. With a little know-how, these summer feasts can be transformed into a celebration of delicious, fresh food with flavour, excitement and a fraction of the calories. Everything you cook on the barbecue tastes great with a fresh and crispy salad which is dressed with a light, flavoursome sauce. You can even round the whole thing off with some mouth watering desserts. For an oriental flavour, try Chinese 5-spice blend. Available in all supermarkets, these flavourings are infused by scoring the surface of the fillets and blending the flavourings to taste with a little soy sauce or Worcestershire sauce. 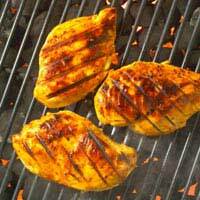 Leave the chicken to soak up the tastes for a few hours before grilling over a hot barbecue. For an even lighter option, substitute the chicken for turkey. The flavours of fish and seafood are so subtle and delicious; you should let the natural flavours speak for themselves by keeping things simple. All you need is a little lemon and seasoning. Use the merest brush of oil to keep the fish moist. Some fish is too fragile for the barbecue so stick to tried and tested options that are a little firmer like tuna steaks or monkfish. To cook whole fish like mackerel or trout, try adding different flavours by pushing peppers, lemon or sprigs of herbs in the body cavity before you grill it. Seafood is a wonderful addition to the barbecue. Score baby squids and leave to marinade for a few hours in a mixture of light soy sauce and chilli flakes or a sweet chilli sauce. The squid cooks in moments on the hot grill, as soon as it curls remove it and enjoy with lots of delicious salad. Other great options are large king prawns and for a really special occasion, there’s nothing like hot, grilled lobster! Vegetables are another fantastic way to experiment with low-calorie barbecue food. Use on their own or as part of a kebab. Either skewer a selection of vegetables or cut them into suitable rounds and chunks for grilling. Good choices are aubergines, asparagus, courgettes and peppers. If you choose good, fresh seasonal options, the subtle flavours of the vegetables will speak for themselves and a brush of olive oil, salt , pepper and maybe a squeeze of lemon will be enough. Steer away from higher calorie beef mince with chicken mince- which is equally tasty.Combine the minced chicken with salt, pepper, chilli flakes to taste and enough egg white to bind the mixture together. If the kebab meat feels too moist, try adding a few fresh breadcrumbs. Leave to refrigerate for a short while so the mixture is easier to handle. Finally soak some wooden skewers in water so they won’t burn on the barbecue and shape the kebabs with wet hands. Keep the kebabs simple or add plenty of fresh vegetables like peppers or onion and tomato. Grill until thoroughly cooked and serve with a fresh green salad. For a lovely sauce to accompany your grilled meat, fish and salads, try this delicious salsa. Low in calories and sky high in taste, it’s so easy to prepare. Chop up a good handful of cherry tomatoes and mix together with a small, finely chopped red onion.Add enough fresh coriander to taste. It’s quite a strong herb, so use it carefully.Finish the fresh and crunchy salsa with a squeeze of sweet, chilli dipping sauce which is readily available in all supermarkets. The only way to go with low calorie barbecue desserts is grilled fruit. Some delicious flavours are waiting to be discovered like grilled pineapple, banana and figs. Grill the fruit for up to 30 minutes depending on the fruit you chose. Pineapple will need much longer than banana. Wrap the food in foil to protect the flesh from the direct heat. Try serving the grilled fruit with some creamy, low fat Greek yoghurt and a swirl of honey. There is another way with barbecues. You can avoid the burgers and sausages without avoiding this wonderful summer cooking ritual altogether. Be brave, experiment and remember simplicity is key.